Today is the most anticipated day for superhero fans!! No, not because it’s the Juicetice Leegue release. 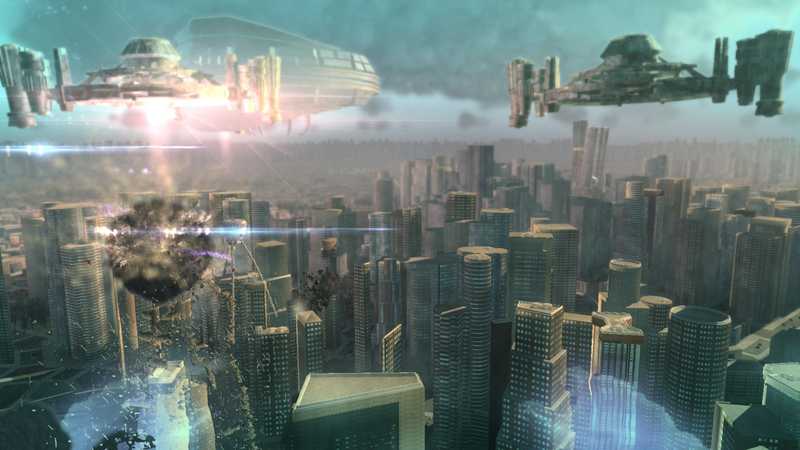 For those of you that still don’t know what is Megaton Rainfall, it’s a first person superhero simulator. You are indestructible and extremely powerful, and you have to save Earth from an alien invasion. The point is that you’re so powerful that every time you miss your targets, you can unintentionally destroy buildings and skyscrapers! After 5 years developing this ambitious game, and one month live on other platforms, I’m happy to say it’s already a sales and critical hit for us. You can check what they say in metacritic. VR enthusiasts will have to wait some more time for the VR mode on PC, but in the meantime, we’ve been working hard to make a top quality port. It’s supports natively your AlienFX laptops and Razer Chroma peripherals, for reactive gameplay light effects. You can also play it with eye tracking technology thanks to Tobii (yes, you can Fire at Gaze, like real superheroes). And the game is so optimized that it can move enormous landscapes and 200 squared miles cities on laptops with integrated GPUs, or achieve 4K @ 60 fps on a GTX 1060. If there’s something that doesn’t work on your PC configuration, we’re available at support@megatonrainfall.com so don’t hesitate to drop us a line. Finally, to celebrate its landing on PC, you’ll get a 10% discount during the first week. – Fixed horrible bug when doing Free mode -> Quit -> Free mode. – Fixed bug that prevented making more than 1 crater on the terrain. – Fixed bug when doing Free mode -> Quit -> Free mode. – Fixed random graphical corruption when using the Gigaton blast vs any city and in other events. – Fixed terrain rendered at incorrect height when approaching the Moon and other planets. – Avoided vibration when the game displays Loading screen. – Increased joystick outer dead zone. – Fixed blinders incorrectly displaying after disabling them when tilting your head to turn. – Fixed mouse not working correctly in main menu in desktop mode when the game works at higher resolution than Windowsis. – Improved/increased FOV in VR mode. – Fixed crash when launching the game in VR mode when your PC has 2 GPUs and the default one is not VR-ready. – Fixed: Triangle button on PlayStation®Move activated both Turn right and Paralyze ability. – Now you can turn around with Square and Triangle buttons on PlayStation®Move mode. – Fixed bug that rendered blinders when tilting your head after being deactivated. – PlayStation®Move support added. You must turn on 2 Moves to play it. The entire game is playable with them. All tutorials redesigned. – Free roam mode added. You must have finished the game before to play it. – Multiple minor fixes and optimizations. – Fixed occasional game breaking bug in Mission 9. – Fixed game over when you use the Gigaton Blast against some props. – Fixed z-fighting artifact in M9 and surrounding most cities. – Fixed random GPU artifact rendering the explanation texts in the options screen. – Fixed a blocking bug introduced in 1.03 where the motherships in M2/M5 randomly appeared invisible and indestructible. – Fixed a bug where the “Get rank A in all the missions” trophy didn’t unlock when achieving it in “Score attack” mode. – Fixed a crash after the credits when you had previously visited any gas planet without approaching its surface. – Fixed a random crash in M7/M8 when some enemies tear up buildings. – Fixed a random crash when destroying Earth with the Gigaton Blast. – Fixed a random multi-thread crash when approaching cities while loading the textures of the monuments. – Now the game will start correctly in VR mode even if an unproperly configured PS VR tracks rotation but not position. – Removed incorrect hint when game over during boss battles in M2/M5. – Fixed a random GPU crash that could happen more likely during start up or the first 15 minutes of gameplay. This was by far the most frequent crash of the game. – Fixed a random multi-thread crash that could happen in any load screen. – Fixed a random multi-thread crash computing the physics of torn buildings. – Fixed a bug where the UI counted human casualties when drilling a tunnel in the terrain and firing the gigaton blast at it. – Fixed a bug where the terrain was improperly rendered near some small cities (the bug was present in 1.01 America, and 1.02 America+Europe). – Fixed a crash when player destroys the pyramid-shaped enemy, then goes to another planet instead of following the next enemy to the city, then reloads the game and then destroys the pyramid-shaped enemy again. – Fixed a crash when player gets out of the current solar system, gets out of the galaxy, enters another galaxy and, without entering any other solar system, returns to the previous one. – Tentatively fixed bug where some of the minions ejected by the pyramid-shaped enemy couldn’t be approached. – Fixed a crash when firing the gigaton blast at the enemy with the wrecking ball, when both the enemy and the ball were hit. – Fixed a crash when you fire the gigaton blast at the city exactly the same frame that a big bomb creates a red explosion. – Fixed a random crash in M5. – Fixed a random crash when firing at the octopus-shaped enemy when it has morphed into a building. – Fixed a random multi-thread crash when you destroy the enemy that levitates nearby vehicles. – Fixed a random multi-thread crash when firing the world multiplying ray on the ending scene. – Fixed a bug where the reflection in the sea was incorrect when looking vertically down. – Fixed a bug where some tutorial texts with words in bold where incorrectly splitted into lines. – Added sound when entering submenus. – Avoided vehicles driving across grass in some areas. – Avoided momentary incorrect rendering of the sea over the cities when approaching them. Megaton Rainfall is out now on PS4 and PS VR. As you may know, I’ve been working 5 years of my life on this project. A massive experiment, involving new render techniques and gameplay mechanics, trying to find new ways of conveying sense of power and freedom of movement, with the purpose of making the ultimate superhero game. I’m thrilled to see the very positive reception, and to confirm that the experiment is successful. You can find our game in the PS Store. The price is 15,99€ / 15,99$ / 12,99£. Also, you can find out more about the procedural destruction tech inside the game in this blog. And now what? We’ll be working hard to solve technical issues in the next few days, and to bring the game to more platforms. Beginning with Steam, that will receive the game on November 17th. Thanks for your patience, and I hope you love our game. Today we’re delaying our game 3 additional weeks, until October 17th. We underestimated how long would it take to us to go through the all the bureaucracy in this (crowded) time of the year. I apologise to those of you that have been waiting for this game for years. Good news is that you can now preorder the game in the EU PS Store here. Also, we are happy to announce our retail price of 15,99€ / 15,99$. The game will support both VR and non-VR modes for the full experience. Additionally, EU PSPlus subscribers will get an additional 20% discount during the preorder. I’m incredibly excited to share the release date of Megaton Rainfall: the game will be comming to PS4 and PS VR on September 26. The PC version will come later but I can’t still can’t confirm the exact date. Today we released a new gameplay trailer. I hope you enjoy it, as well as the game. After several years of hard work and delays, finishing this game is being a herculean task, and I can’t wait to get it in your hands. Looks like I’ve spent the year earning merit for being the worst community manager ever (namely, not posting anything). People keep writing to me, asking the big question: when will this game be released? If you are one of them, thanks for your support and be sure that, if I haven’t answered yet, sooner or later I will. I’ve spent 2016 improving the quality of the game to a point that I never thought it would reach. I have been assisted by 4 artists (Hector Esteban Richart, Víctor Tardío, Álvaro Monzón y Rafael Romero), That’s not counting my friend David Saavedra, who made the cover. The audio is being completely revamped, including an all-new OST and hiring a voice actor (my original idea was an unvoiced game). VR has proven to deserve a massive amount of development time: 6 different control interfaces have been implemented and tested (you will find them all in the options screen), and lots of optimizations have been implemented to make the most of PS4/PS VR/PC hardware at rock solid 60 fps. I have only showcased the game in 2 events this year (in one of them it earned the “indie game of the show” prize). In October I made a new trailer that I never published but, despite being light-years more advanced than the one you have probably seen, now I think it’s obsolete again, eclipsed by the recent improvements in visual quality. It will be remade soon (and very likely it will announce a release date). So that pretty much sums up this year. I promise to write again in less time. I leave you with a screenshot. Hi everyone, in case you missed this video or this post, I’m happy to announce you that Megaton Rainfall is coming to PS4 and PlayStation VR next year. Applause! I’ve been working for almost 2 months on porting the game to the PS4 and Morpheus hardware. By the way, did I mention that Megaton Rainfall runs on a custom engine, specialized in rendering an immense amount of (destructible) buildings and objects on screen? So the porting is definitely not a drag-and-drop piece of cake. In fact I have suffered the 2 or 3 hardest bugs to find in the entire project history in the PS4 porting (the #1 hardest bug took me 12 hours to find it in case you were wondering). But it’s done and I can tell you that the game is already working at 60 fps in PSVR with most of the features activated. For me the PSVR is a surprisingly fine piece of hardware. It has a cool technical feature called reprojection that I think all developers will love. It means that if the frame rate drops one moment, you still see 120 frames per second when you move your head around. The system, 120 times per second, reprojects the last frame that you rendered according to the movement of the player’s head since you rendered it. So these hiccups don’t affect the player in terms of motion sickness. I can’t wait to know the release date and price… They haven’t told me 🙂 By the way, I’m definitely not launching the game at early 2016. About the non-VR PS4 version, I’ve still not decided whether to go for 30fps or 60fps. When I played Everybody’s gone to the rapture I thought “games at 30fps look better”. Now I’m playing Metal Gear Solid V and I think “games at 60 fps look better”. So maybe it depends on the game I’m playing when the release date comes 🙂 Don’t hesitate to give me your opinion if you want! Hi everyone. The last weeks I’ve shown Megaton Rainfall in 3 different tradeshows: Boston Festival of Indie Games, EGX in Birmingham and Madrid Games Week. But I don’t like tradeshows very much! Besides being expensive (flights and hotels don’t have indie-friendly prices), they are completely unuseful for promotional purposes. If I spend a week making a trailer I could maybe reach tens of thousands of people. But if I spend a week (including preparations) to attend a tradeshow, showing my game in 10-minute demos for 8 hours a day for 4 days… Well you can do the math yourself. Also, some tradeshows don’t give you a press list to arrange meetings with the press (like Boston FIG and Indie Megabooth at GDC did, but EGX Leftfield Collection and MGW didn’t), and without it the visibility you get for being there is very limited. It would also have been cool to get an award. I had hoped to achieve the technical excellence award in Boston, given the amount of propietary technology that I’m developing to make my game, from full-Earth rendering technology to procedural destruction of buildings, but finally it went to this game Xeero, for its solid bug-free programming. Ok, everything is subjective in this life and I also like bug-free games. But in Madrid, the “jurors” at Made in Spain Games at MGW were beyond subjectivity. They gave 5 or 6 awards and didn’t even play my game. I know for sure, because they didn’t come to play and didn’t ask me for a build. It’s not subjective, it is insulting. 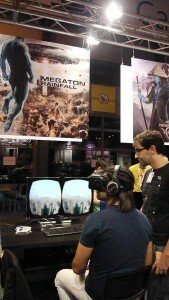 Other positive thing of attending tradeshows is the possibility to play the games other indie developers are making. It’s inspiring. There is so much talent out there. In MGW I discovered Calendula, an intriguing game that doesn’t want to be played. In EGX I found Four Sided Fantasy, a platformer with a simple but extremely powerful gameplay mechanic (why do I not have those kind of ideas?). And two rythm-based action games, Aeero and my personal favorite Thumper… The feelings that this game can convey in just a few minutes, with its disturbing music and its indescribable visuals is amazing. I finished their demo twice. Can’t wait for the full version. Oh, in Boston I didn’t have much time to wander around and play games so didn’t find anything worth mentioning there. Finally, what I love about tradeshows the most. It happens every time. There are people who absolutely love my game. Well, almost everybody give me positive feedback. But there is some people, maybe 1 out of 10 or 15, that say that my game is the very best indie game around. Like this guy in EGX or this other guy in MGW. They are enthusiastic. Some of them come to play several times. They say I’m making something ambitious and special. Thanks to them I go back home motivated and happy. I want to make the best game I can do, so that I can fulfill their expectation. So, thank you Jordan Pailthorpe and David Hayward for choosing my game for your festivals. A. The development is cancelled. B. I’m the worst community manager in history. C. I’ve taken a year off work. And the right answer is… B! 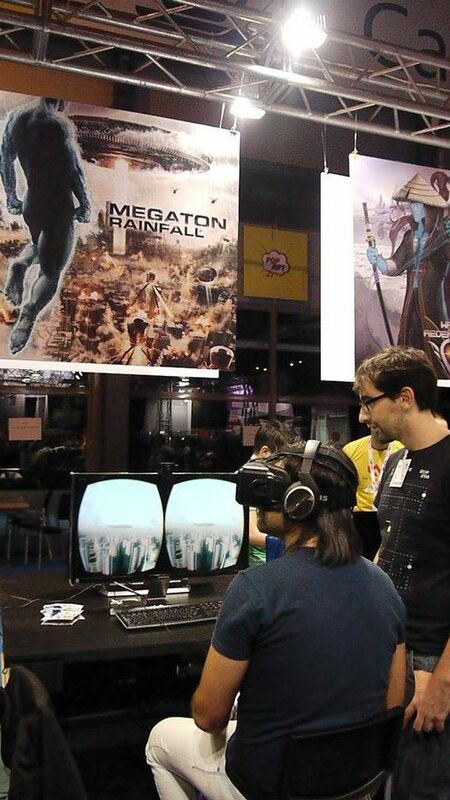 Don’t worry guys, Megaton Rainfall is in heavy development, and will be ready for a Q1 2016 launch. The game is now playable from start to finish. The last months I have seen a lot of people playing it (specially at GDC, by the way thanks to Chris Floyd, Ryan Burrell, Kelly Wallick and the rest of the Indie Megabooth staff for that incredible oportunity), and I got a very good feedback. But I don’t want just a very good experience, I want to create a perfectly polished game, that surprises the player over and over and that doesn’t disappoint the high expectations that I’ve created in a lot of people. So the rest of the year will be expended in increasing the quality of the game… and making it compatible with a surprising number of devices! More on that later. Hi everyone! 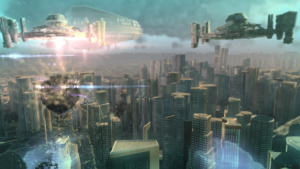 Welcome to the Megaton Rainfall development blog. What is Megaton Rainfall? Who am I? My name is Alfonso del Cerro and I have been programming games for the last 10,5 years. One year ago I decided to go indie. I have spent the past 3 years working on this project (2 years free time, 1 year full time). I promise MR will be a record breaking game in many ways. If you’ve seen the teaser, you can figure out that one way will be the scale of destruction. There are other superhero games, but in them you don’t unintentionally destroy skyscrapers every time you miss your target. More on that in another post. MR will be demoed at the Indie Megabooth at Games Developers Conference 2015. Visit me if you drop by there! PS: Don’t forget to follow me on facebook/twitter.